Let’s be honest. There are tons of books about personal finance. Why should you read this one? The simple answer is because you’re smart, independent-minded, and don’t want anyone telling you what to do. 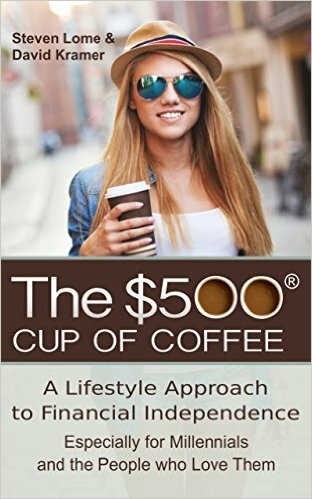 Unlike other how-to books, The $500 Cup of Coffee leaves it up to you. Calm your money fears by demonstrating that your financial goals are within reach even when you don’t hit the mark every time. Most importantly, we provide the information and inspiration you need to make good financial decisions about education, work, home, retirement, and even marriage. When you know what to consider, we’re confident you’ll ask the right questions and make the right choices. No matter how young or old your are, how much you owe or own, or how you feel about money today, The $500 Cup of Coffee will help you take control of your money – one painless step at a time -- so money worries stop controlling you.